The Clippers had numerous reasons to trade Blake Griffin, but it was still a stunning surprise. Here's why L.A.'s new brain trust ultimately decided to deal its franchise star. LOS ANGELES – Blake Griffin writhed in pain, his gigantic body sprawled on the floor, his left leg trapped awkwardly underneath Austin Rivers. The Clippers were playing the crosstown Lakers in late November, and the All-Star forward’s latest injury loomed like a superstar-sized straw to break the franchise’s back. LA had just endured a nine-game losing streak fueled by long-term injuries to Danilo Gallinari, Patrick Beverley, Milos Teodosic and virtually every other veteran that coach Doc Rivers might want to play. With Chris Paul no longer around to play hero, the outlook was grim. But in the minutes after Griffin’s injury, owner Steve Ballmer was ebullient, not ashen. He walked off the court with Lou Williams, patting the guard on the back and shoulders with his trademark zeal to celebrate a 42-point explosion in a last-minute win. Was Ballmer simply trying to glass-is-half-full his way through this season-altering turn of events? Was he in denial? As Ballmer exited the Staples Center tunnel and turned to leave the building, the former Microsoft executive said, “Now, let’s go see about Blake.” His tone was measured, not frantic. Both he and Griffin had walked this walk before: the MRIs, the waiting, the recovery timeline, the rehabilitation and, eventually, the return. Many times before. The diagnosis could have been worse—​it was only a knee sprain—but LA nevertheless suffered four straight losses, falling to 8-15 and prompting speculation about Rivers's job status, DeAndre Jordan’s trade value, and the merits of tanking. Unexpectedly, though, the Clippers responded in December much like their owner had: they didn’t freak out, panic or collapse. Rivers turned to new and unfamiliar faces, Williams kept scoring, Jordan kept defending, and LA’s rag-tag rotations—full of players who were anonymous even to diehard fans—​managed to close out December with an 11-6 record. 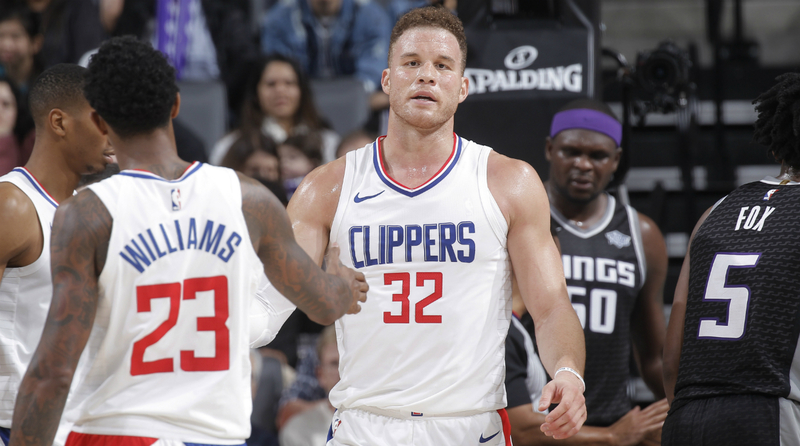 By the time Griffin returned on Dec. 29, LA was still hanging around in the West’s playoff picture, instead of following the Mike Conley-less Grizzlies to the bottom of the standings. Griffin, a five-time All-Star and one of the most versatile power forwards in the game, embodies many of those qualities. He’s competitive to a fault, willing to chuck a basketball at a referee to dispute a call. He plays so hard that he has run himself to exhaustion in the playoffs and undergone numerous surgeries along the way. He’s smart enough to be one of the league’s top point forwards, and he owned up publicly to his biggest misstep—​a late-night punch of a team employee back in 2016—like a franchise player should. The problem for Griffin, though, is that he wasn’t being paid to fit into a culture. He was being paid to carry an expensive roster to contention, especially after the Clippers gave him a five-year, $173 million max contract this summer. On that front, in those cold terms, he hadn’t lived up to expectations. Not even close. With Griffin, the Clippers were 17-16 this season. Without him, they were 8-8. His per-game stats suggested an All-Star selection if healthy—22.6 PPG, 7.9 RPG, 5.4 APG—but his impact numbers lagged. The Clippers’ overall net rating of +0.6 was virtually the same as Griffin’s +0.8 net rating, meaning LA played just about as well with him as without him. In past years, the Clippers had been utterly helpless when Paul and Griffin subbed out of games. This year, that just hasn’t been the case. In most cases, pointing to the injury as cause for patience with Griffin’s impact would usually make sense. But LA had numerous reasons to be cold and calculating with respect to a player who, just months earlier, they had wooed during free agency with a mock jersey retirement at Staples Center. Griffin is a top-five salary-earner this season. He’s missed 40% of his team’s games over the past four seasons. He’s suffered season-ending injuries during the past two postseasons. His pop and burst have waned over the last few years. And he’s under contract—​at a gigantic number—through his age-32 season. On top of all of that, the Clippers, who have regularly paid luxury taxes in recent years, are sitting right on the tax line again this season. Deciding what to do with Griffin came down to a series of straightforward “yes” or “no” questions. Was Griffin, in his current form, capable of being the top guy on a contender? No. Were the Clippers in position to build a contention-worthy roster around him in the short-term given his salary number and health concerns? No. Would their record and play fall off the table without him? No, at least not as much as one might have assumed entering the season. Would the Clippers be better off letting someone else pay Griffin’s nine-figure deal as they pursued a deeper, more versatile and cheaper roster? Yes. On Monday, the cutthroat Clippers pulled the trigger on a Griffin trade, sending the 2009 No. 1 pick to the Pistons for forward Tobias Harris, guard Avery Bradley, center Boban Marjanovic and multiple picks. In Harris, they add a scoring combo forward who can space the court and work interchangeably with Gallinari. In Bradley, they add a backcourt defensive specialist who potentially represents future cap flexibility, as he is in the final year of his contract and hasn’t played well enough this season to warrant a massive summer payday. The draft picks represent a symbolic shift for the franchise: After years of playing short rotations dominated by veteran players under Rivers, LA launched a G-League affiliate this season and has placed greater emphasis on player development. The Clippers’ ultra-expensive “Big 3” model – so successful for so long – needed to give way to something entirely different. In moving Griffin so quickly after they pushed so hard to re-sign him, the Clippers will take heat for their ruthlessness. And Griffin will need some time to process the move to Detroit – to put it politely. But this trade shouldn’t necessarily be viewed as a typical star-dumping teardown: The move doesn’t meaningfully alter the Clippers’ postseason chances, it widens their options at the trade deadline, it potentially improves their ability to re-sign Jordan and Williams next summer if they so choose, and it helps modernize their lineups by breaking up the big-ball Griffin/Jordan tandem. Plus, it was only going to get more difficult to trade Griffin with each successive injury and with each additional year of aging. Yes, there’s a risk that Griffin turns out to be the “Next Amar’e Stoudemire,” an athletic marvel whose career ultimately falls short of expectations due to premature decline. But there is also the chance that Griffin becomes the “Next Carmelo Anthony,” a large-market icon limping through his post-prime years in front of an increasingly bored and disgruntled audience. The Knicks could sell that formula in New York as the biggest show in town. The Clippers—who had already slipped from 10th in home attendance in 2016-17 to 20th this season—weren’t going to be able to make that work as the No. 2 team in LA. The 2009 lottery ping pong balls that gave the Clippers the right to select Griffin are displayed prominently in a glass case at the team’s Playa Vista practice facility. It’s a fitting tribute. Griffin arrived as a franchise-changing star for an organization that desperately needed him, and he played a leading role in building and maintaining the Clippers’ golden era. He deserves to have his jersey retired one day, as long as he’s able to look past what surely feels—in this moment—like a betrayal. Now, Griffin departs with a bang. The franchise he changed so dramatically decided to change again. This time, without him.